Among the synonyms listed for 'listen' are accept, attend, observe, take notice, monitor, receive, welcome, lend an ear, take into consideration and tune in. If you're doing any of these activities, then you're on track to living principle 5. People supporting people with a disability need to know these different communication styles and methods, as each requires different ways of both perceiving the communication and responding to it. … any device, system or design, that allows an individual to perform a task that they would otherwise be unable to do, or increase the ease and safety with which a task can be performed, or anything that assists individuals to carry-out daily activities. Other common terms you may be familiar with include aids and equipment or home healthcare. Assistive technology can include simple products such as those that assist you to open a jar or bottle, or turn a tap or open a door. Complex technologies can include specialised computers, powerdrive wheelchair controllers, home automation and environmental control systems. They can also include environmental design and home modifications or a different technique or way of doing a task. aids for verbal communication (speech generating devices, tablets and smartphones, switches, visual communication items such as alphabet and choice boards and much more). You can learn more about these technologies by contacting the South Australian Independent Living Centre (ILC). The use of some or all of these technologies means family, friends and support workers need to respond appropriately to the communication method. It may be that you need to watch, rather than listen, if someone uses an alphabet board. You may need to obtain Braille versions of books for people who have a visual impairment. You may need to allow more time to have a conversation for someone who can speak, but whose tempo may be slower than usual. 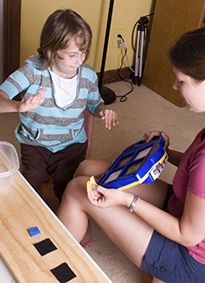 Read the information on augmentative and assistive technologies. Ask people how they prefer to be addressed and respect their wishes. Give people information about the support you're providing in advance and in a suitable format. Don't assume you know what people want because of their culture, ability or any other factor - always ask. Ensure people are offered 'time to talk', and a chance to voice any concerns or simply have a chat. If a person receiving support does not speak English, translation services should be provided in the short term and culturally appropriate services provided in the long term. Staff working for service providers should have acceptable levels of both spoken and written English. 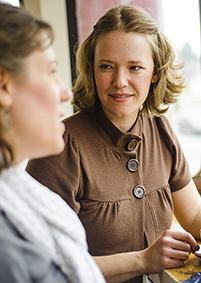 Overseas staff working for service providers should understand the cultural needs and communication requirements of the people for whom they are supporting. People providing support should be properly trained to communicate with people who have cognitive or communication difficulties. Schedules should include enough time for staff to properly hand over information between shifts or when other carers are taking over support. Services should involve people when information resources are produced to ensure the information is clear and answers the right questions. Services should provide information material in an accessible format (in large print or on DVD, for example) and wherever possible, provide it in advance. Find ways to get the views of people to whom you're providing support and respect their contributions by acting on their ideas and suggestions. Are we respectful at all times in our communication with those we support? Do we recognise the adulthood of those who are of that age, and avoid at all times patronising phrasing or condescension? Do we allow enough time for the people we support to communicate with us, and for us to communicate with them? Do we ask questions, where possible, to clarify anything we haven't understood? Are augmentative and assistive technologies available to the people we support, to help them communicate with others? If we do all these things and more, we are supporting people to be listened to, to communicate, and to have their needs and wants met. Listening – it's about recognising and acting to serve the humanity and individuality of the people with and for whom we work.